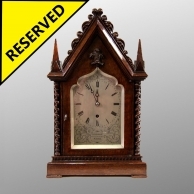 A rare and more importantly, totally original, silvered dial with painted arch automata Longcase clock. The eight day duration, weight driven, five pillar movement with Anchor Recoil escapement and rack striking the hours on a bell. The pallet arbor assembly having an attachment to operate the automata at every tick and the striking train having a pulley attached to operate a further automata whilst in the process of striking. 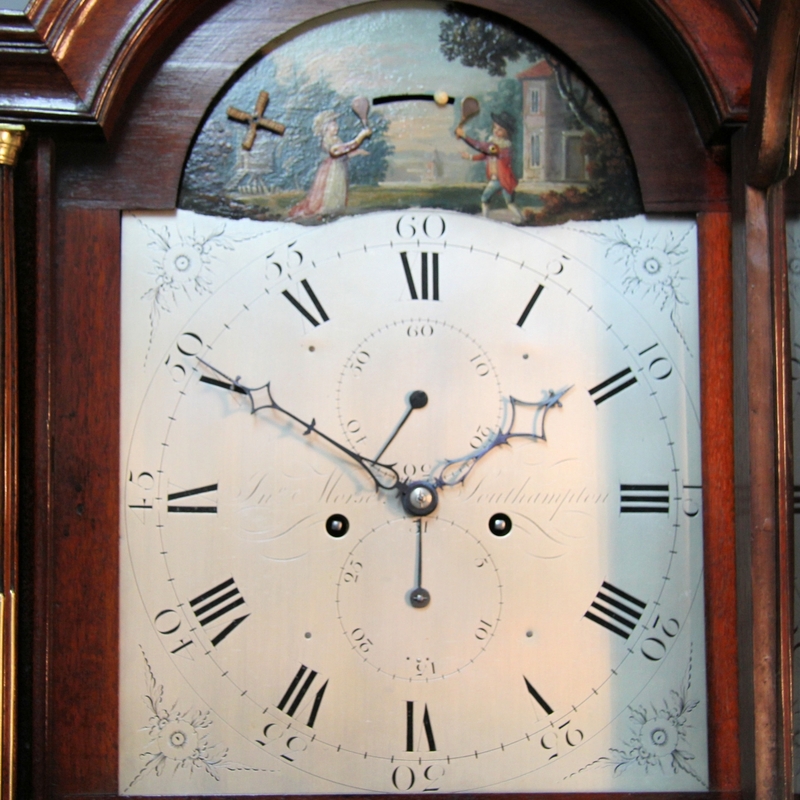 Behind a 12" wide, silvered brass, break-arch dial with painted arch, Roman hour numerals, minute circle with dividing marks, a further, outer ring with large Arabic fives placed within, floral pattern corners and the centre portion having subsidiary seconds and calendar dials with Arabic numerals. 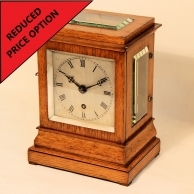 The maker's name "Jn.o Morse (of) Southampton" beautifully executed and placed across the centre line and the time hands being pierced diamond style in blued steel. 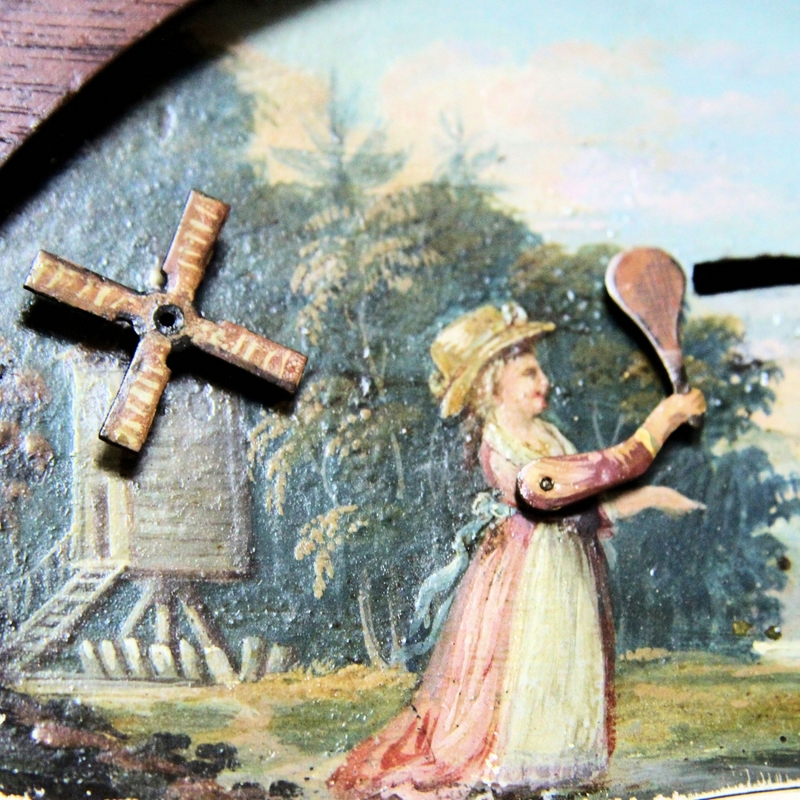 The well-preserved painted arch depicting a boy and a girl in period dress playing Battledore and Shuttlecock on a lawn with a house and small windmill in the background. The figures are batting the shuttlecock to each other with every swing of the pendulum and the windmill sails revolve upon the movement striking. 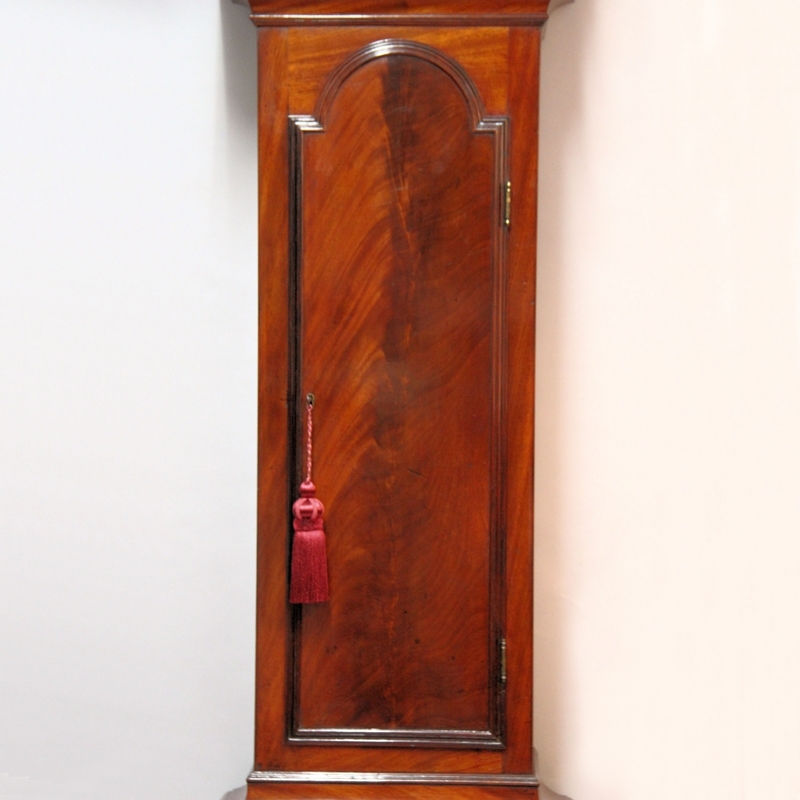 Contained in a break-arch, flame mahogany case of good colour and patina. 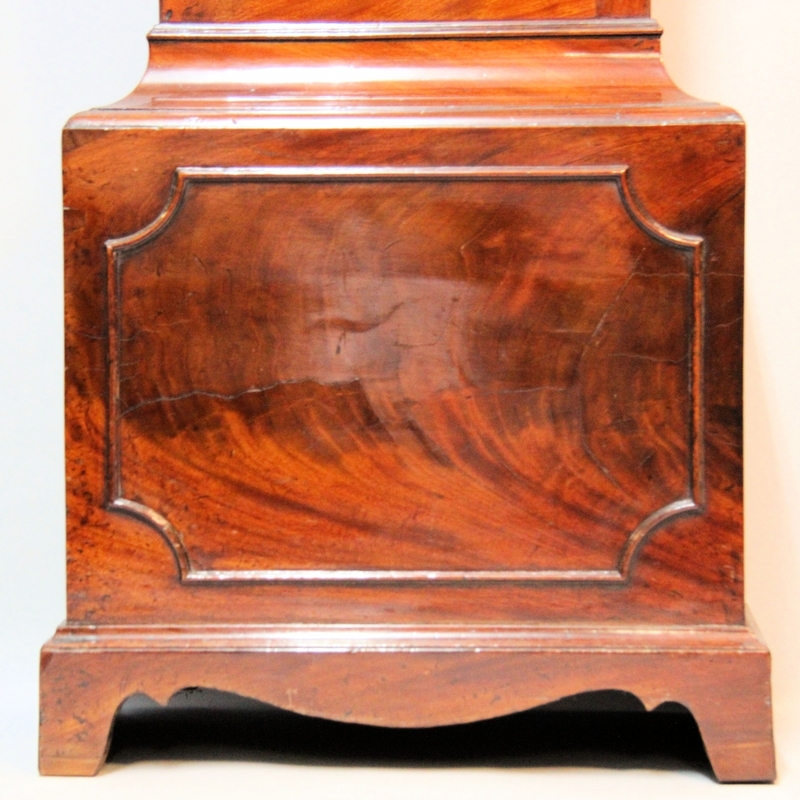 The hood having well-formed mouldings, fluted and brass-reeded pillars with brass capitals and side inspection glasses. The flame cavetto trunk throat sits nicely just above the flame, full-length, raised trunk door with elaborate moulding to the edging and the base having a panelled front and shaped plinth. 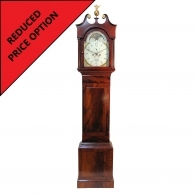 * All longcase clocks made by John Morse are of good quality and his 'style' flows throughout them all making them unmistakable. 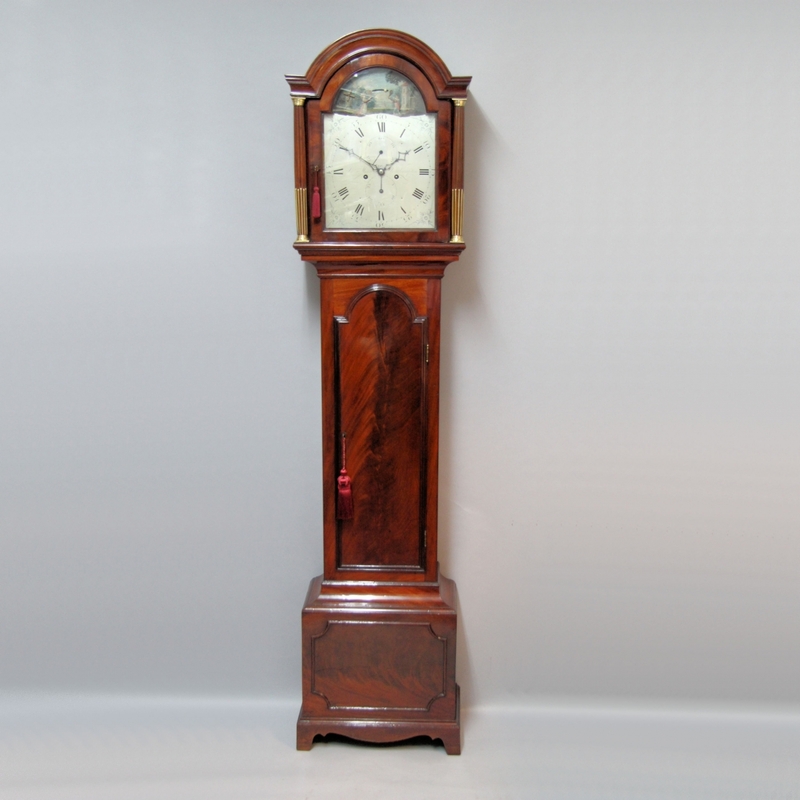 They all seem to be made during the late 18th century however, there is a listing of the same name in West Cowes I.O.W. in 1809 - it is widely believed that this was his son. 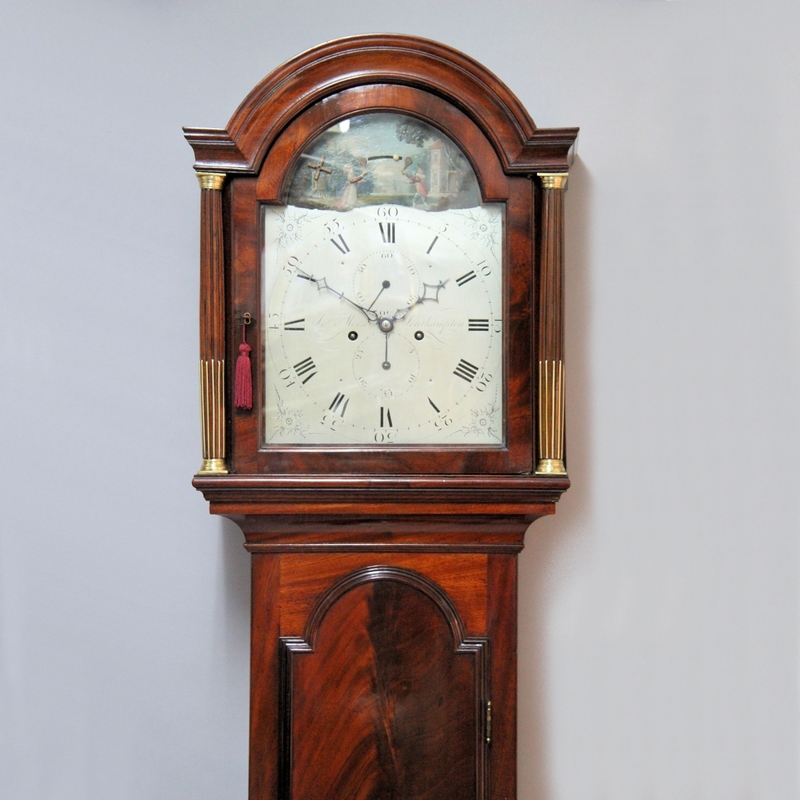 This example is absolutely typical for this maker and the case style can only be attributed to Southampton and the surrounding areas. 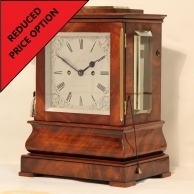 This is definitely a clock that would suit a 'purist' collector. 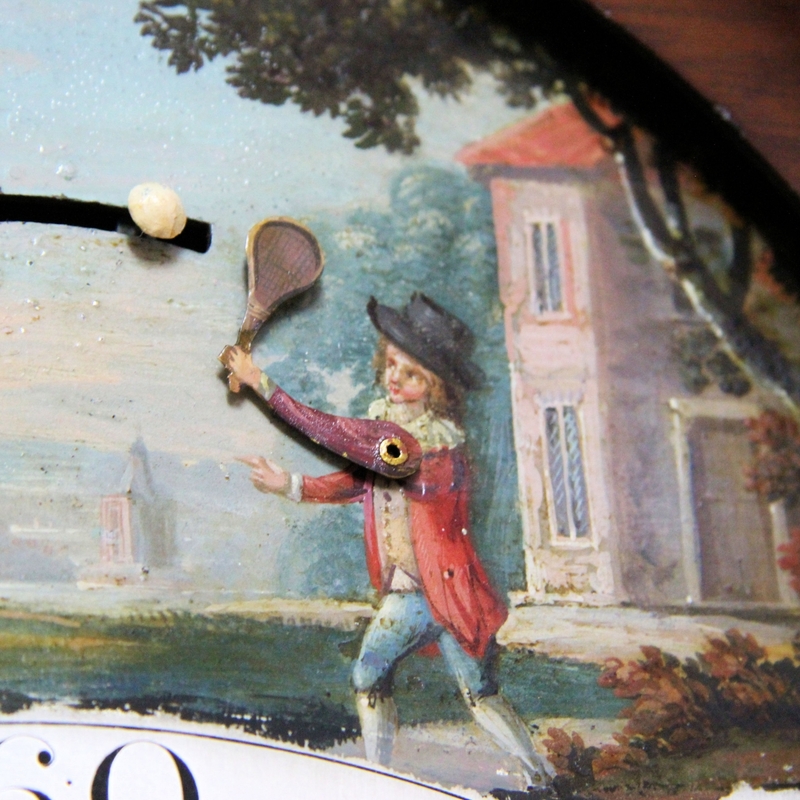 Original clocks such as this are rare, especially in good condition. 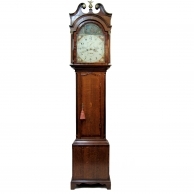 The height of this example is pleasingly quite small as is its general appearance. ** Battledore and shuttlecock is the forerunner of Badminton and its roots can be traced back 2,000 years. 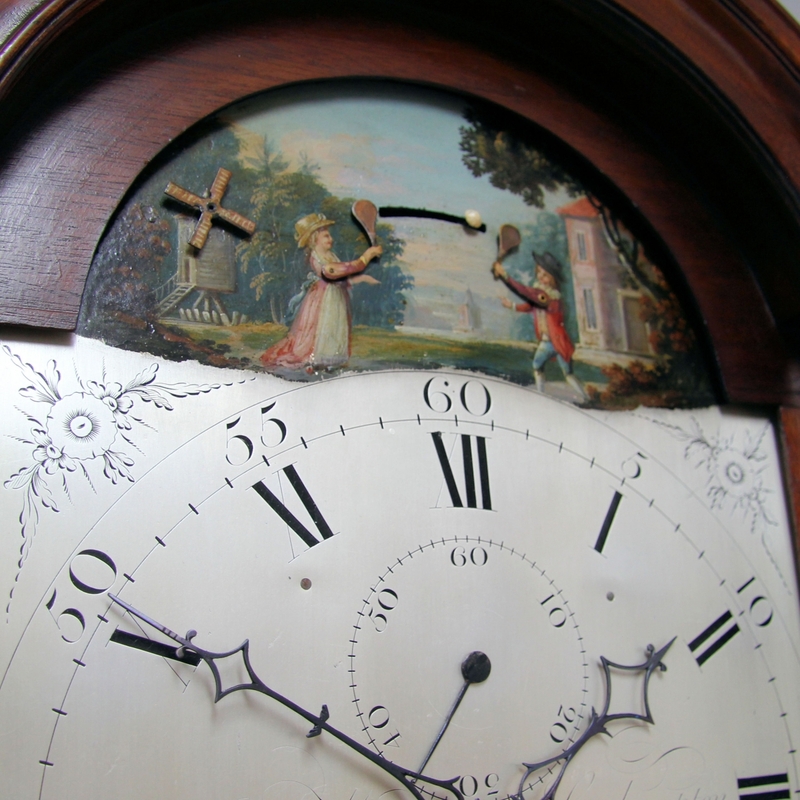 It was played by two people and was particularly popular during the late 18th century. Dimensions: 81" high x 19 1/4" wide x 10" deep. Condition: Excellent and very original.